The mortgage world moves fast. This is true of the technological advances that are always being made, the way that businesses continually evolve within the mortgage space, and mortgage rates themselves. In a world that never seems to sit still, having a pricing engine supporting and updating your rate data constantly is a major advantage for businesses looking to stay ahead. 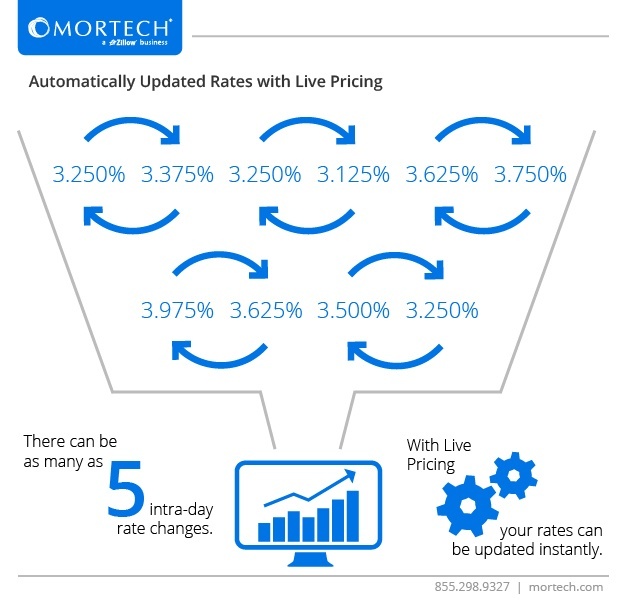 With Mortech, you can further evolve your business and update your rates faster than ever via our Live Pricing functionality. We recently announced an integration with QuinStreet, that provides this live, up-to-date data to the thousands of online mortgage shoppers within QuinStreet’s network. Picture this scenario: it’s the day of a Fed meeting and your rates are changing. Rates can change up to five times a day, and each time they do, you send over a flat rate file with your updated rate tables. In the time it takes for these files to be sent over, uploaded, and applied online, thousands of borrowers are viewing your rate data, that is now incorrect until those new files can be applied. This creates a less-than-ideal shopping experience for online borrowers, and can get your relationship off to a rocky start. But, with Live Pricing, you don’t have to worry about any of this. Imagine that same scenario, only this time with Live Pricing instead of flat rate file delivery. Each time your rates change, those changes are instantly applied anywhere that your rates can be found online, providing instant and accurate rate data to the same thousands of borrowers that would otherwise be viewing your old, out-of-date data. By utilizing this Live Pricing functionality, you create a better online shopping experience for your borrowers, and also save yourself the time and hassle of having to stress over getting flat rate files sent and applied to your rates. But how can you get access to this functionality in the first place? That part is easy. Simply contact your account manager if you’re already a Marksman user, and they can get you started. Not a Marksman user, but want to find out more about this, and other features? Contact us today for a short, free demo and find out how Mortech can help your business move at the speed the mortgage world requires.